Inspired by Emily’s suggestion about creating diaries and the like for our characters I’ve come into the modern world and set up a Facebook page for one of mine — except that it’s a bit more complicated as this is something that will probably really happen in the novel. 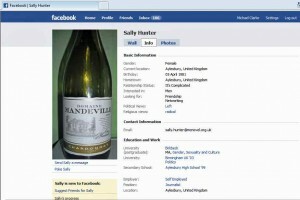 It’s for Sally Hunter — alter-ego wine writer of eco-grunger Sally Edmonds — and she’ll use her Facebook persona to establish her wine-writing credibility. It’s early days yet — I want to her to become a fan of various wine related things and so on but I’ve had to put in things like education and date of birth. I’ve kept those pretty true to Sally Edmonds’ details. I’ll be interested to see if Sally gets mail (she has her own genuine e-mail address which she needed to set up the account) from people who went to Aylesbury High School orÂ Birmingham or Birkbeck Universities thinking they remember her. 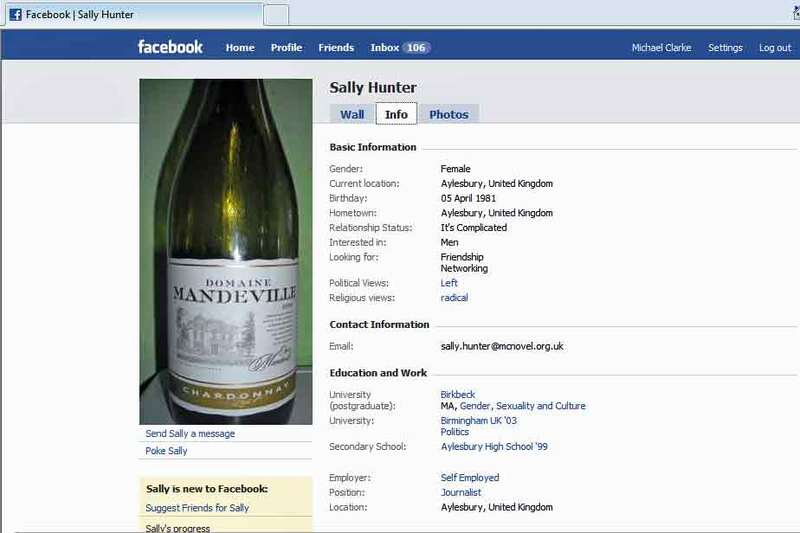 I think if Harry Hill’s Knitted Character can have a Facebook page then so can Sally. Here’s how she appeared on my page — note her relationship status. Click on the images to read the info in more detail. Sally’s only got one friend at the moment so I’m sure she’d love more. You can search for her on Facebook using her mail address sally.hunter@mcnovel.org.ukÂ (note there’s no ‘a’ in that spelling of mcnovel). 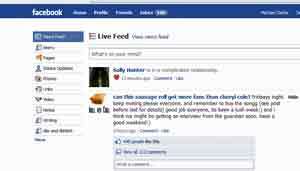 In due course Sally’s network will extend to other social-media-using characters who will make friends with her — Ana, Frances and maybe even Robert.